Vacuum cleaners of Dyson, Hoover, Shark Navigator and more are available on the latest Target Ad. Some of them are exclusive products to the Target stores. Dyson V6 motorhead cord-free vacuum will cost only $249.99! Earn Free $20 gift card for buying Shark Navigator DLX upright vacuum at Target. The Target Weekly Ad Aug 5 - 11 will be outdated after tomorrow. There is a new sneak peek of the new ad; Aug 12 - 18. You can check it out on our preview page. In this category of home appliances, find kitchen products. Magic Bullet 11-pc. blender set will cost $29.99 and that's a sweet $10 saving. Whirlpool fridge, SodaStream and more devices are currently viewable on the same page. 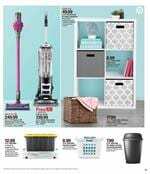 Gift cards, awesome discounts, wide product range and alternative options to anything in the home category of Target Weekly Ad. Don't forget to subscribe to this page and follow our Facebook page. Find all these products in the ad and enjoy shopping at Target.